Ashford golfer Benn Barham is eager to put a disappointing season behind him and regain his European Tour card. 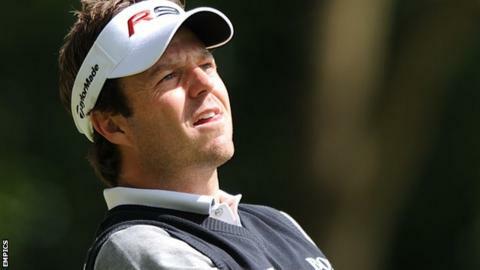 Barham, 36, told BBC Radio Kent: "I know what it's about having had a tour card for five years in the past. I'm itching to get back on there. "I started the year feeling good but I've not produced. My preparation has been the same as previous years." Barham lost his card in 2009 and then took time away from the game to have a cancerous kidney removed. His best finish this year was joint 11th at the Colombia Classic in March, and his recent tie for 55th at the Toulouse Open ended a run of three successive missed cuts. He said: "I've gone to events and - I've become fed up of saying so - I've played quite good. No area of my game is letting me down. "I'm miffed as to why this season has been a bit of a flop but, you never know, there are a few more events to come this season then I go to the tour school and, hopefully, get my card." The exciting conclusion to the Ryder Cup at Medinah brought home to him how fortunes can quickly change in golf. He said: "Golf can be about momentum - a certain putt goes in at the right time or a good bounce or a good lie can make such a difference. "If I can have a tournament where things go my way then I can build some momentum and confidence and then press on."